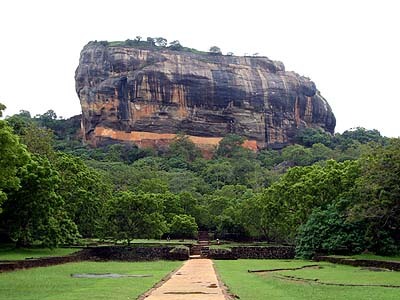 The two national languages of Sri Lanka are Sinhala and Tamil. These languages are written in different scripts, although their curlicues can look much alike to the uninitiated; both scripts are ultimately derived from Brahmi. Sinhala is an Indo-European language related to Sanskrit; Tamil is a Dravidian language that is spoken in South India. English speakers should just pronounce the words as spelled; the Sri Lankan accent is not easy to understand or to speak, unless you have lived there for a while. Native Sinhala or Tamil words exhibit many vagaries of spelling and pronunciation in English. To start with, the consonants "v" and "w" are often substituted for each other, and likewise the vowels "a" and "e". The letter "t" can be written "th", and "d" can be written "dh". The letter "l" can be doubled; weak syllables can be dropped; and so on. Many of these alternations appear elsewhere in South Asia and SE Asia, but in Lanka they seem to be encountered much more often. It's useful to keep these rules and examples in mind, especially for print searches. If you are looking things up online, search engines like Google may suggest some, but not necessarily all, possible alternative spellings.